Preheat oven to 200°C degrees. Slice oranges into half and rub the cut end over the turkey, squeezing out the juice over the entire bird. Rub salt, black pepper and paprika inside and out of the turkey. Put the thyme, rosemary and parsley inside the cavity. Also stuff the celery, onions, potatoes, carrots into the turkey. Rub the turkey all over with olive oil. Place the turkey in a roasting pan, breast side up. Bake for 1 hour. Then cover the turkey loosely with a sheet of aluminum foil. Lower the temperature to about 175°C and continue baking, basting at 15-minute intervals, for about 1 1/2 hours longer. Transfer the turkey to a platter, rest for around 20 minutes and serve it with your families. Roasting a turkey is not an easy task. It takes hours and a lot efforts to cook a gorgeous and delicious turkey. 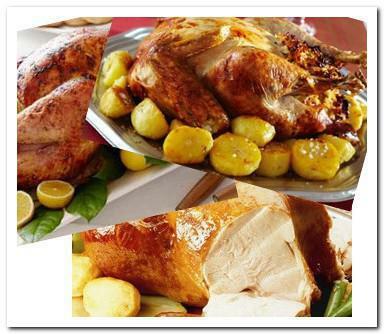 To roast a good turkey, try to keep the meat moist and juicy but the skin crispy. Seasoning, temperature and good control of baking time are important. It takes patience to roast a good turkey, but it is not difficult. All people can do it right, just follow the recipe step by step.